Preheat the oven to 180°C. Prepare a 23cm square baking tin by greasing all over with a little butter. Line with awide strip of baking paper, leaving two ‘tails’ at either side to help you lift the cooked brownie out of the tin. Break up the chocolate into squares and put into a heatproof bowl along with the butter. Set over a pan of barely simmering water and allow to gently melt, stirring to mix together as it does so. Tip the beetroot into a food processor and process to a puree, pausing the motor to scrape down the sides if necessary. Add the melted chocolate and butter and the eggs and whizz again until combined. Again, scrape the sides down, then add the sugar, ground almonds, cocoa, baking powder and chilli powder (if using) and process until you have a smooth batter. Pour into the prepared baking tin and bake for about 30 minutes until the top is set and the brownie is starting to pull a little away from the sides of the tin. A skew inserted into the centre will come out fairly clean but stick a touch sticky – don’t worry if it still seems a little soft as it will firm up on cooling. Remove from the oven, place on a cooling rack and allow to go cold in the tin. 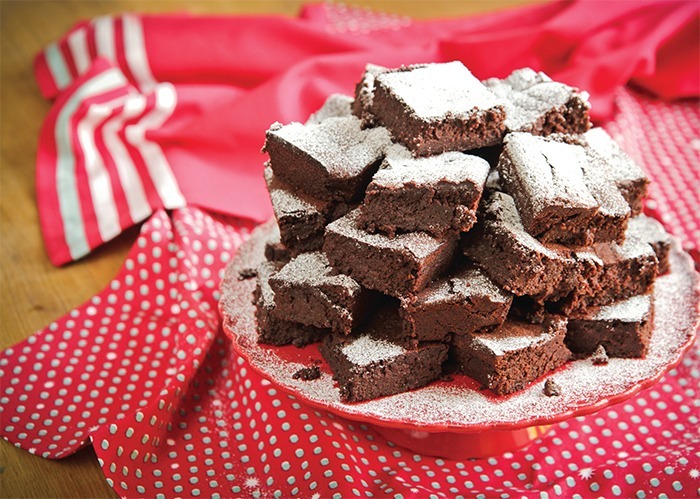 Using the baking paper tails, ease the brownie from the tin and cut into 16 squares. Dust the surface with a little icing sugar.